Lafayette Physical Therapy Blog What’s Causing my Hip Pain? The hip joint is a large ball and socket joint designed to withstand significant stresses such as supporting our body weight when running and jumping, in addition to the normal wear and tear of daily activities such as walking and stair climbing. 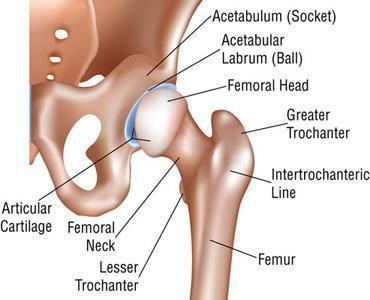 The hip joint is comprised of the head (“ball”) of the femur (“thigh bone”) and the acetabulum (“socket”) of the pelvis. Surrounding the hip joint are many tough ligaments that provide support and protection to prevent the dislocation of the joint but allow a wide range of movements. The strong muscles of the hip region also help to hold the hip joint together and to move the bones. Cartilage lines both the acetabulum and the head of the femur providing a smooth surface and preventing friction between the moving bones and allowing them to glide smoothly past each other. Between the layers of the hyaline cartilage or the small bluish layer of collagen that is present in joints and the respiratory tract, there are synovial membranes that secrete watery synovial fluid to lubricate the joint. It is this cartilage that is the primary source of pain in a hip joint with Osteoarthritis (OA). There are many causes of hip pain including injury, trauma, rheumatoid and Osteoarthritis, labrum tears and impingement, osteoporosis, pinched nerves, tendinitis, bursitis and more serious conditions such as cancer, prolonged steroid use, and some childhood diseases. There are many causes of hip pain and the location of the pain can be indicative of the cause and source of the pain. Depending on the location the hip can cause pain in the groin, the inside or outside aspect of the hip, along the side of the buttocks, front or side of the thigh and near the lower back. Problems within the hip joint itself tend to result in pain on the inside of the hip or in the groin area. Conditions such OA, labrum tears and impingement are usually in the groin area. Injury or trauma related pain or hip pain from overuse results in pain over the outside and front of the hip especially with conditions such as hip bursitis, hip tendinitis, and muscle strains. Severe Hip Injury and Pain – Usually an injury or trauma causing a sudden, intense pain in the groin or inner part of the hip or thigh, an inability to bear weight or stand on the leg, difficulty walking, the inability to move your leg or if the leg appears deformed or has a sudden increase in swelling are all indicative of a serious injury or severe condition and you should call 911 or get to the ER or Urgent Care right away. Hip pain felt in and around the outside of the hip, near the outer buttock and back area and along the upper thigh are usually related to problems of the soft tissue such as the muscles, tendons and bursa (which provides lubrication between the tissues). When the bursa is inflamed, the condition is called bursitis. These following common conditions could benefit from the care and guidance of a physical therapist. 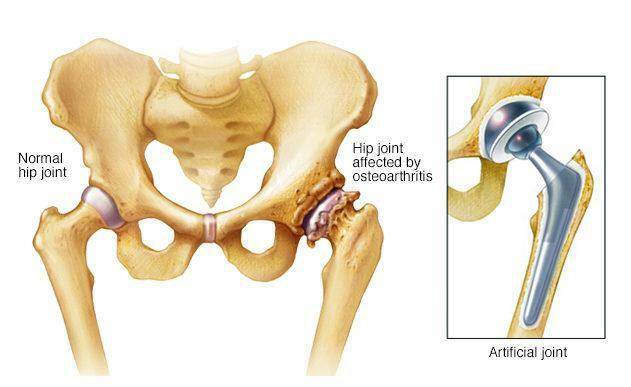 Osteoarthritis (OA) is an inflammatory process that causes the degeneration of the hip joint, usually felt in the groin area. It is the wearing down of the cartilage and disruption of the smoothness that covers the bones which leads to eroding and exposing the bony surfaces which causes the pain. This genetic condition affects millions of people and women more than men, and is age related. The condition may be exacerbated by injury and should be assessed. The underlying process of Osteoarthritis cannot be reversed but the symptoms of Osteoarthritis can be managed and the inflammatory process can be suppressed or delayed with medications, gentle activity including maintaining and improving mobility of the joint, sustaining adequate strength of the core and lower extremities, maintaining a healthy body weight, and with proper care of the hip pain and symptoms as soon as it begins. Prolonged medical treatment may include steroid injections, joint lubrication injections or ultimately partial or total joint replacement. Injuries, trauma and overuse – Many conditions of the hip are often related to trauma such as falls and accidents, and from overuse such as running, sports, or jobs that require repetitive stresses on the joint. Hip injuries including muscle strains and inflammation of the tendons (tendonitis) and bursa (bursitis), which are all common and can be managed with simple self-care procedures. A physical therapist can accelerate the healing time and provide important guidance on getting well after an injury. Common symptoms of hip pain include tenderness, stiffness, loss of mobility, weakness, grating or grinding sensation and sounds. If there is no serious injury or in major pain as described above, rest and elevate your leg, apply ice and take over the counter anti-inflammatory and/or pain relievers (ask your MD about which medications you can take). Avoid lying on the affected side, bending, twisting and walking around until you feel more comfortable. Avoid any motions that cause an increase in your pain. Begin gentle movements, like lifting your leg, when your pain subsides; begin weight bearing by putting your foot on the floor while sitting and assessing for any pain before standing. If your symptoms or pain do not subside in a few days call your physician. Conservative medical treatment may consist of an X-ray or MRI to confirm the condition and referral to physical therapy services. Written by Gary Corso, Physical Therapist at Lafayette Physical Therapy, Inc.